Recently, I was asked by someone to write anything about Germany, from its politics, government, economy, military, history, geography, demography, technology, and also fashion. Here I'd like to show about the articles of its fashion that I found. High fashion made in Germany is a firm feature on the international catwalks. For decades now designers such as Escada and Wolfgang Joop have been global players, the latter having recently enjoyed tremendous success with his glamorous new “Wunderkind Couture” label. Not infrequently the big galas and balls in Berlin, Frankfurt and Munich appear to be a showcase for the achievements of German fashion-makers: On show are Escada, Unrath & Strano, Talbot Runhof and Anna von Griesheim – who are popular not just with German high society. In everyday life, Germans tend to focus more on the down-to-earth. 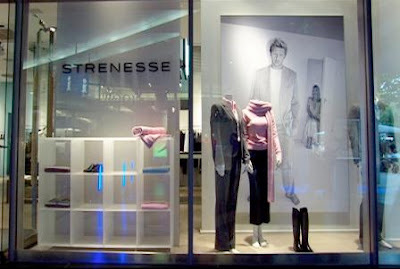 In addition to functional business attire they tend to prefer casual sportswear, such as Boss and Strenesse. Though headquartered in southern Germany, both labels have long been well established in international markets. In major German cities in particular there is ample opportunity for experimenting with fashion. Full of wit and ingenuity, a whole host of creative fashion designers put up stiff competition with fashion centers such as London and Paris. The Berlin Fashion Week, with shows by well-established and new designers, is a key fashion event in the capital. Insiders have long been familiar with the new German fashion avant-garde, which include Thatchers, Coration, Sabotage, Kostas Murkudis and Eisdieler from Berlin, as well as Blutsgeschwister from Stuttgart, Anja Gockel from Mainz, and Susanne Bommer from Munich. Young German fashion designers such Markus Lupfer, Bernhard Willhelm and Dirk Schönberger have conquered even London, Paris and the fashion-conscious city of Antwerp. That said, the most famous German couturier abroad is undoubtedly Karl Lagerfeld, who was born in Hamburg and is Creative Director of Chanel, the legendary French haute couture company. German product design has a reputation for creating carefully devised, straightforward functional products. Design made in Germany – from Bulthaup kitchens to Braun razors – is held in high regard in the international arena. Companies such as furniture manufacturers Wilkhahn and Vitra still lead the way in terms of style, as do Lamy for writing implements and Erco for luminaires. The traditions of Bauhaus in the 1920s and the Ulm College in the 1950s are still highly regarded, but in the meantime a new generation has made a name for itself. It includes Konstantin Grcic, who was born in 1965 and is one of the most innovative young designers. Born in Munich, he accords totally banal everyday objects an unfamiliar touch of poetry. The newcomers from “Studio Vertijet” in Halle, Steffen Kroll and Kirsten Hoppert, also blend playful and analytical design elements in their work.